BELLINGHAM – For Dave Barber, a trip on Franklin and Bellingham section of the Southern New England Trunkline Trail isn’t just a chance to exercise your legs, it’s an opportunity to glimpse into the past. 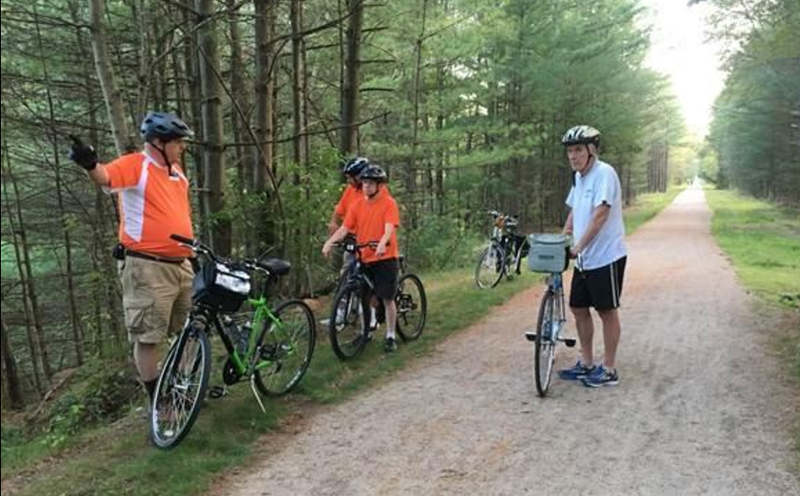 Barber, a member of the Blackstone River Bikeway Patrol, said he suggested the venue for a ride last Wednesday which was promoted through the Blackstone Heritage Corridor. Though the recent project did improve the trail, Barber said, there is still work to do. The trail committee has been working for a tunnel to run beneath Franklin’s Prospect Street. Money for the project had been included in a state bill, but Gov. Charlie Baker has not yet released the funds, he said. “The problem is that you have to climb up (a hill) steeply, cross the road and go down steeply,” he said of the Prospect Street portion of the trail. Should the tunnel go forward it would greatly increase the bikeable section of the local trail. Barber said he wasn’t sure whether Labor Day weekend would bolster trail use, as it is already well traveled. “People are using it every daylight hour of every day,” he said. This entry was posted in Bellingham, Trails in Massachusetts, Upper Charles Trail. Bookmark the permalink.